As we progress deeper into the autumn season, many are beginning to wonder if the upcoming cold pattern is a precursor to the type of winter that we will see. Unfortunately, it is not as easy as cold October yields cold winter or warm October yields warm winter. If that were the case, we’d have long range forecasting figured out by now and there would be no need for winter outlooks, as the winter would be set in stone by the end of October. The best we have are correlations, analogs, physical pattern drivers, and pattern persistence. When added together, the summation of these various factors provide a higher probability of success in medium to long range forecasting, but these methods are far from perfect. With that being said, the evolution of different atmospheric oscillations during the autumn season can give us a substantial clue as to the ensuing winter’s dominant index modalities. In this particular case, let’s examine the autumn north pacific pattern of years since 1990, giving us a sample size of 22 years (we would have to wait through this winter to see if 2013’s correlation holds up). The north pacific pattern is often represented as the East Pacific Oscillation (EPO). Like the North Atlantic Oscillation, the EPO has certain, generally predictable outcomes when it oscillates from positive to negative phases. 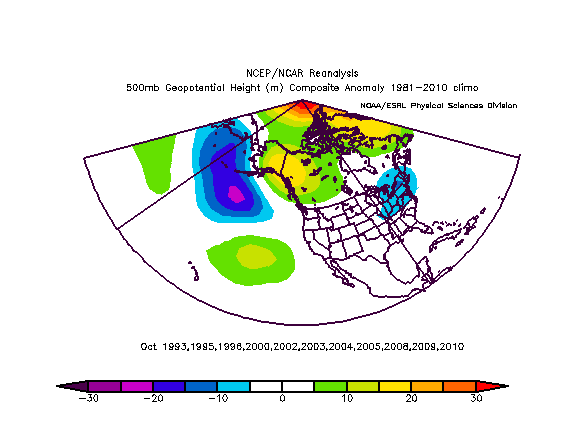 The positive phase of the EPO is usually associated with lower than normal heights across the northeastern Pacific, much of Alaska, and northwestern Canada. Conversely, the negative phase of the EPO generally produces higher than normal heights over the region just described. The positive (+EPO) tends to flood the United States with maritime pacific air due to the low pressure around Alaska, while the negative (-EPO) acts as a block to maritime pacific air due to high pressure over the NE Pacific/Alaska. The -EPO often sets up a cross polar flow with high pressure centered over Alaska and the flow oriented across the north pole from Siberia into Canada. The -EPO pattern has yielded some of most impressive, severe arctic outbreaks on record. The upcoming 10-15 days, for example, will be colder than normal in the East primarily due to the forcing from the negative EPO signal in the northeast Pacific. There’s not much blocking in the north Atlantic or arctic regions, so the main impetus for this cold through November 5th is the -EPO. 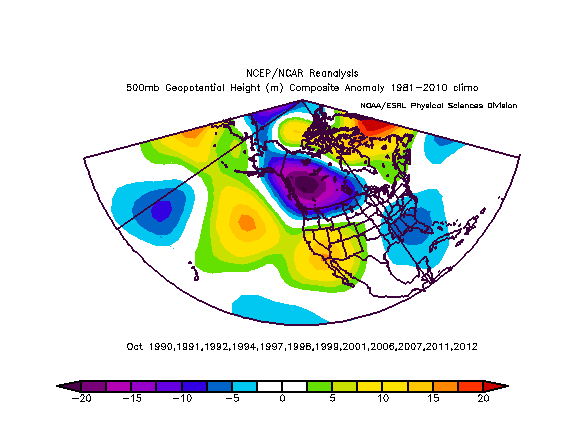 If you notice, the October patterns prior to those cold/snowy winters generally had higher than average heights around Alaska and the Northeast Pacific. Let’s fast forward into November. Below are the Novembers preceding those same winters. 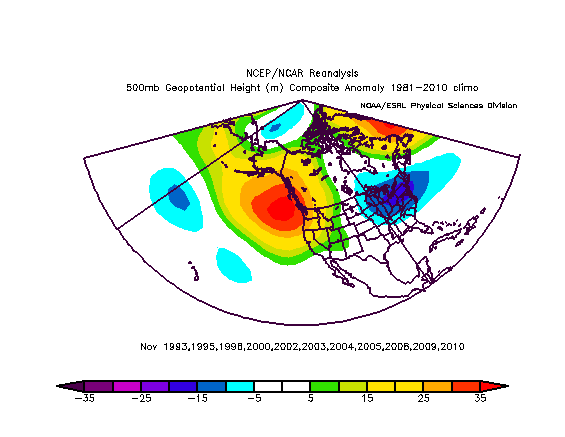 The overall negative EPO / higher than normal height pattern in the NE PAC and Alaska persisted through November, and then as we know from having experienced those winters, through the Dec-Jan-Feb period. This is indicative of the tendency for EPO patterns to repeat and persist in a dominant fashion from mid/late autumn through the ensuing winter season. 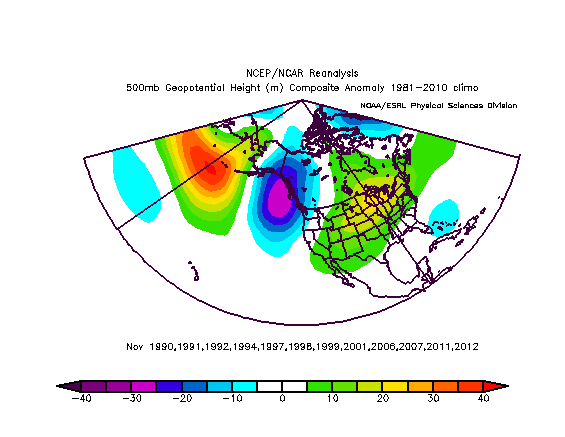 Notice the tendency for lower than normal heights in the NE Pacific and around Alaska. Low pressure dominated the region. The resultant pattern is +EPO for November as we can see above. The conclusion from this is that the autumn, Oct-Nov, EPO / North pacifc pattern is often a clue to the ensuing winter’s north pacific / EPO pattern. Our warmer, less snowy winters have usually been preceded by autumns with a positive EPO predominate signal, while our colder, snowy winters usually followed autumns of negative EPO patterns. The regime we have right now and the next couple weeks is negative EPO, with strong height rises in the NE Pacific and around Alaska, thereby flooding the Plains eastward with significant cold for the October 20th-November 5th period. However, the question becomes, does this negative EPO / high height pattern in the north pacific continue through the month of November? As we see in the images above, it is not only October but also November that gives us a clue as far as the potential Dec-Jan-Feb pattern. The takeaway message here is to hope for continued blocking near AK as we approach Thanksgiving, if you’re a cold/snow lover. If you’re hoping for a warm winter, you should be hoping for a reversal of the current pattern (which does often happen) to a November positive EPO regime. Time will tell how the next several weeks evolve. Until then, let’s enjoy the first frosts/freezes for most of us over the coming nights.